Temples and Palaces were the ancient galleries for mural paintings in Kerala. One such temple which has been attracting a large number of art lovers from all over the world is Sri Thodeekalam Siva Temple near Kannavam. It has made a remarkable position in the tourist map of Kerala. Sri Thodeekalam Siva Temple is located about 2 km from Kannavam near Thalassery on the way to Manathavadi, Kannur district, north Kerala. This temple said to have been constructed 2000 years ago, has sanctum sanctorum constructed in two storeys and is square in shape. The outer buildings, which are almost destroyed by Lord Tippu and an incomplete Mukhamandapam (portico) in front of the central shrine completes the whole structure. Since there is no Dwaja Sthamba (Flag post) infront of the temple, there is no long lasting festival in this temple. Still on the days of 'Sapthami' and 'Ashtami' in Malayalam month 'Vrishika', and on Sivarathri (on Malayalam month of 'Kumba'), there will be festivals. Elephant is restricted in this temple for festivals. Sri. Nandiar Valli Namboodiripad is the Thantri of the this temple. The main offerings of this temples are 'Shankabhishekam', 'Pushpanjali', 'Sarpabali' and 'Dhara'. 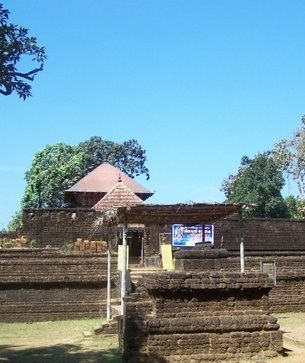 About Kerala temples Stella Kramrisch, an authority on Indian Art, once wrote- "In this beauteous, bountiful country, between see and mountains, green in the density of high trees and fertile land, the temples-2200 are in worship- are part of scene"